Child Support is money paid by one parent to the other for the benefit of the children of the parties’ relationship. By law, the primary responsibility for the cost of raising children rests with their parents. Some parents reach an agreement about the payment for the support of the children by one parent to the other. In circumstances where there is no agreement, in Australia, the responsibility for assessing and monitoring the payment rests with the Child Support Agency, rather than the Family or Federal Circuit Courts. The amount of money that is paid by one parent to the other is different for every family, and depends on the particular circumstances of the household and each party’s income. The assessment of payable is based on the application of a statutory formula. Whilst the child support formula was previously relatively simple, it was recognised that each family has different circumstances, and so the formula has varied in more recent years and become more complicated in an effort to accommodate a broader variety of different types of families. 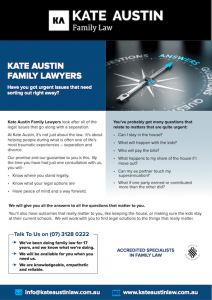 Why use Kate Austin Family Lawyers? The laws with respect to child support have become quite complex. There are limited means by which you can challenge assessments that have been conducted by the Child Support Agency. The payment of child support is, for some families, a sensitive issue, and we can provide you with the best options to ensure that payments to be made are fair and viable. 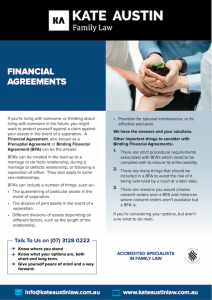 We can also prepare child support agreements and look at other ways that child support can be incorporated into an overall property settlement. The child support formula in Australia looks at each party’s income. It also looks at how many children there are in the family, and how much time each child spends with each of their parents. The cost of raising children is also incorporated into the child support formula. What if I don’t agree with the assessment that’s been calculated by the Child Support Agency? There are options to dispute the assessment of child support payments. The first step is to complete an Application with the Child Support Agency, which sets out why you don’t agree with the assessment. This Application is then submitted to the Child Support Agency who can either conduct a re-assessment based on the information provided, or make no change. Further steps are then available to have the decision made by the Child Support Agency reviewed. The process can at this stage become quite complex and it is advisable to obtain some legal advice at this point about your options and the basis upon which you can pursue the matter further. 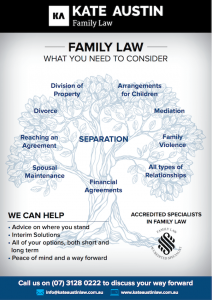 Do separating parents have to use the Child Support Agency? Many parents reach their own arrangements for the payment of child support, working out the payments and how they will be made between themselves on an informal basis. 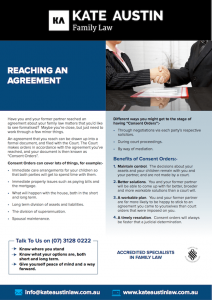 There is also provision for parents to have their agreement formalised by way of a Child Support Agreement. This should be prepared by a lawyer. It is signed by both parties and can be enforced, as though it were a court order, if one party doesn’t comply with it. Child Support Agreements can be limited, operating only for a set period of time, or they can be more general, applying until the youngest child turns 18.